Today I’ve been deep in the land of DIY. It’s actually storming here in Dana Point, which means I stayed indoors and tackled some back-burner projects and organizational things. Here’s a couple of links to my efforts! Paper Ornaments for the apartment. These adorable leather/cork wall thingys. The recipe for today is actually the result of many requests. 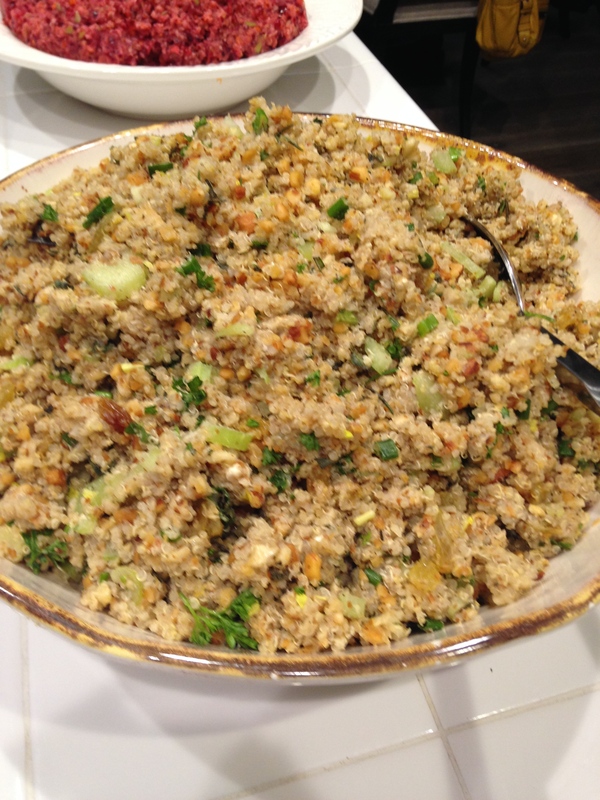 The hubby and I catered another event this past weekend and my Nutty Herb Quinoa was extremely popular. People had 4th and 5th servings. No joke. Let’s get this out-of-the-way right now.. I realize that quinoa is not paleo. But it IS real food. It’s vegan/vegetarian friendly. AND it’s a gluten-free grain. Which makes it a very group-friendly dish. So kick up your heels and enjoy this holiday-inspired salad as a side or a main at you next cozy gathering. 1. in a food processor, pulse nuts until they are the texture of gravel. 2. in a bowl, combine all ingredients (except for dressing) and mix well. 3. drizzle aminos and olive oil onto the mixture along with nutritional yeast, salt, and pepper. Toss well. 4. add more salt, pepper, or nutritional yeast depending on your taste preference.